Hello everyone, Julie here, another week has passed by so quickly and it's time for new card write up! Today's card uses the Imagination Crafts' Large Lily stencil as the main focus. Firstly I started with a square of super smooth card and blended Spun Sugar and Shaded Lilac Distress Inks to make my background. I then taped my stencil over this and applied Imagination's brilliant Structure Paste and left to dry overnight. The next day I put the stencil back over the dry paste and applied Starlights metallic paintswith my finger to the image. The colours I used were Kiwi Green, Bright Fuchsia, Green & Pearl mixed and Lavender & Pearl mixed. I graded the colours to get a more interesting look. 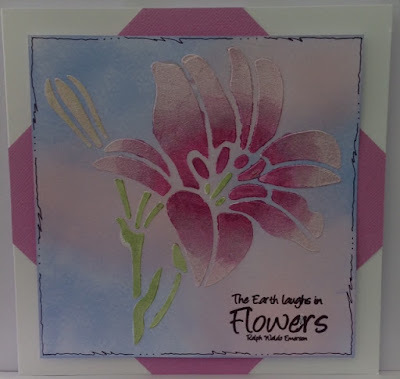 I stamped a sentiment from the Card-io Say It With Flowers set in purple ink and heat set with WOW! 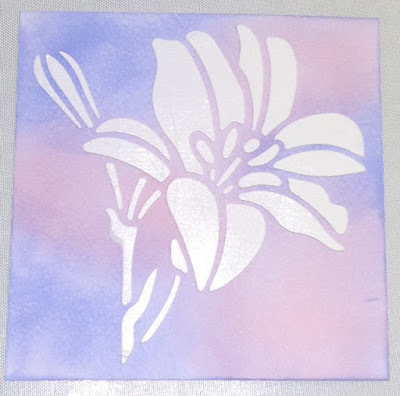 Clear Gloss embossing powder. I used a Micron pen to add some detail around the edge of the card. I added the card, using foam pads, to a square of light purple card which I'd placed diagonally on a 7x7" white card blank. Well that finishes my card today, I hope you liked it. You can find information about Lisa's PaperArtsy & Imagination Crafts' Textiles workshops HERE & bookings can be made via the website. Time to Relax - Steampunk Style!